For corporate America, offering workers access to healthy food is a win-win that leads to happier workers and fewer sick days. For leading tech companies like Google, it’s better if the food is delivered with a sprinkle of technology to match company culture. On May 31, Google’s New York office partnered with upcoming innovation expo Food Loves Tech to host a #MakeFutureFood competition, where thinkers and makers were invited to present ideas to an all-star panel of judges on how corporate food service could help to increase food literacy. Entrants were asked to envision the future of the workplace pantry. The popularity of tackling healthcare at work is catching on. In recent years, the links between chronic disease and poor lifestyle choices have become more apparent. The biggest culprits of obesity, heart disease, and type 2 diabetes are on the rise, and experts know that diet can go a long way to improve symptoms, or even prevent these diseases. Since most Americans in the workplace are at an age when interventions can still change their long-term health trajectory, and since the most productive part of the day takes place at the workplace, the popularity of tackling healthcare at work is catching on. Corporate wellness, of which healthy food is a part, is an $8 billion dollar industry in the United States, and it has grown at 4.8 percent annually since 2011, according to research firm IBIS World. According to a 2013 employer survey by the nonprofit think tank RAND Corporation, about half (51 percent) of employers in America with over 50 employees offer at least one workplace wellness program. These can include preventative screenings, on-site vaccinations and nutrition counseling, while creative companies may offer trendier perks, such as workplace yoga, meditation, and power nap rooms. Chicken Broth w/ Wonton Noodles, Chicken&shrimp, Brocolli, Carrots, Jalapeno, Cilantro and Sambal~ @ Threads Cafe – #google, Mountain view, CA, tomorrow will be serving…..? Stay tuned Yee~ #googlecafeteria, #googlefood, #googlemountainviewcampus, #wontonnoodlesoup, #foodstagram, #국수, #푸드스타그램, #먹방, #먹방스타그램. There are enormous incentives for employers to get on board, especially by offering healthier food, which is one of the most powerful ways to signal to workers that a company culture that promotes healthy behaviors. When workers have access to tasty food that is good for them, it helps them stay mentally aware and productive, even in the afternoon. Fewer sick days and lower employee health care costs aren’t a bad business outcome either. Michiel Bakker, global director of Google Food Services, said recently he wants to inspire people to see food choices as a way to build more sustainable lifestyles and communities, according to the Food Innovation Program, which is sponsored by the University of Modena and Reggio Emilia’s Engineering Department. Google’s outstanding free food, sourced locally and sustainably whenever possible, is widely seen as a key ingredient in its notoriously high workplace satisfaction. Google earned the top position in seven of the last 10 years on Fortune’s 100 Best Places to Work list. Google operates 300 cafes and 1,000 micro kitchens (also known as office pantry) in 56 countries, serving 125,000 meals per day to Google workers and guests, according to Kim Huskey, Google’s New York office food service manager, speaking at the competition. Give Workers What They Want! The Make Future Food competition winner Sous Labs is envisioning a data and information enabled way of empowering workers to choose what they love. The pre-startup is the brainchild of MIT engineering grad Arash Kani, and his partner Audrey Bosquet, also from MIT. Sous Labs puts trust in the workers by empowering them to make good decisions. Kani, a culinary technology consultant, believes Sous Labs could use a socially-connected app, and radio frequency identification (RFID) tags placed on food items to track what employees are consuming in the workplace. Sous labs would then analyze the data with machine learning, and use it to satisfy worker preferences. For example if tea is a big favorite at one part of the workplace, Sous Labs could deploy a smart cooking appliance like the smart tea maker Teforia. RFID tracking has long carried the promise of improving transparency for food supply chains, but the expense has been an obstacle, particularly for cheaper items. Kani said he believed tags could be had for as little as 2–5 cents, and a transponders to measure consumption for about $20 each. At these prices a pilot could be done with a few thousand dollars. Bosquet said Sous Labs puts trust in the workers by empowering them to make good decisions. Eating well is a daily—even minute to minute—challenge for most of us. The judges reminded the panelists about the importance of positive solutions. I love the vibe. This is definitely a happy product. Workplaces need that. One such positive concept that would help stressed out office workers make the most of their day was presented by Daicha Perkins, co-founder of Picnycs. Her company delivers a picnic, complete with a basket, blanket, food, and drink, to major city parks. “You have just a few minutes to enjoy your lunch. See you at the park,” said Perkins during the competition. “I love the vibe. This is definitely a happy product. Workplaces need that,” said judge Marcus Samuelsson, chef and restaurateur of Food Network fame. AVA, meaning Artificial (Yet Natural) Intelligence, is an early stage company looking to develop a smart wrist band that would track stress, emotional states, feelings, and attitudes, using wireless bluetooth technology. It would be your friend, your dietician, your exercise coach, and your camera, said Dennis Katz-Nelson, founder of AVA, at the competition. Samuelsson questioned Katz-Nelson about the concept, which would invariably spit out recommendations such as “eat salad because you ate a chocolate bar earlier,” and so on. “Do we really want another indicator of what we are not doing?” It’s depressing, Samuelsson said. 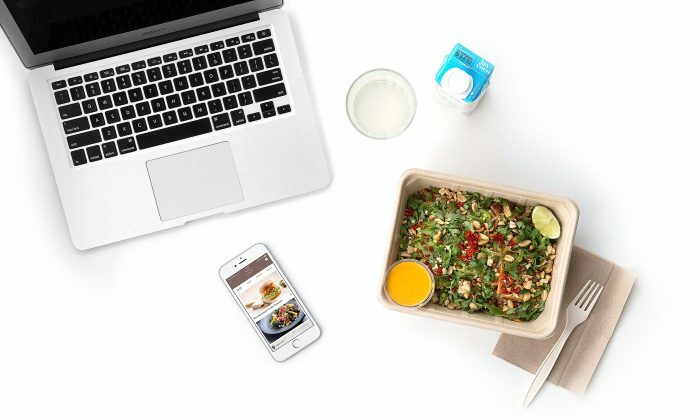 For Adrian Chong, in charge of customer experience for Toronto, Canada-based delivery-only restaurant Feast, improving workplace wellness is about making healthy food more accessible to workers. Chong says Feast can deliver high quality lunches and dinners to workers within 12 minutes. The company’s biggest competitor, Uber Eats, is “hit or miss,” according to Chong. So is its other major Canadian competitor, Just Eats. “It’s another food aggregator.” Companies that rely on existing restaurants to complete take-out orders, while still serving the front of the house, are at the mercy of those restaurants. An average worker’s day is fluid, and filled with meetings. It’s frustrating to order food and have it arrive unpredictably. Feast wants to make the choice to eat healthy easy. “This is all we do and all that we care about,” explained Chong. Feast sources ingredients locally and offers workplace menu customization. While the team is still working to reveal full transparency for its sourcing, the company aspires to make a food story available for each ingredient. The company, which launched just 5 months ago, and employs about 80 people, is an end-to-end service provider in that it cooks all the food in a central commissary, and employs its own delivery crew. Consistent with its mission, its delivery staff use customized Danish cargo bikes and BMW i3 electric vehicles to navigate Toronto’s dense downtown corridors. Chong said in a telephone interview that food leaders in corporate environments already feel strongly that food can add to overall wellness in the workplace, and keep people healthy and productive. How will the food technology compel workers to actually use it? Feast offers a subsidy program through its app that allows employers to give their employees complete freedom to choose the individual meals they want, when they want them. According to Huskey, the future of corporate food for entrepreneurs hoping to break into the market involves making an impact, changing minds, and changing culture. “Sometimes giving the knowledge is not enough.” How will the food technology compel workers to actually use it? This is where Cabinet Lunch got some feedback from the judges. This concept-stage company’s idea is to offer workers an app that would create healthy recipes from food and snacks that are already provided in the workplace pantry. For example, one could make a salad by chopping up cheese sticks and cherry tomatoes, and mixing it with olive oil and seasoning. A social media function is meant to encourage engagement with the program, according to founder Zarreen Ali-Khan, but how do you actually get people to use it? Why not use a Slack Bot? asked judge Gould. Slack is an increasingly popular instant messaging tool used in tech companies, and so workers are already using it. A Slack Bot can be programmed using application program interfaces (APIs) to interact conversationally (and automatically) with other Slack users, or external services. Right on the application’s developer page, there is an example of a Slack Bot keeping track of a company grocery list. The future of the workplace pantry indeed! CORRECTION: A previous version of this article incorrectly stated the number of cafes Google operates globally. The correct number is 300. Epoch Times regrets the error.